The man charged with overseeing the building of the venues and infrastructure for the London 2012 Olympics has been named. 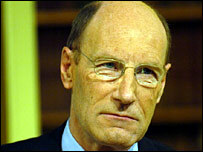 John Armitt, the chief executive of Network Rail, will become chairman of the Olympic Delivery Authority. He succeeds Jack Lemley, who quit last October claiming there were spiralling costs and delays. Armitt, 60, has worked in the rail industry for 14 years, including on the Channel Tunnel. Before that he was involved in the construction of Sizewell B nuclear power plant. Mr Armitt will take up the £250,000-a-year post on 1 September. He described the appointment as "a tremendous honour". "The Olympic Delivery Authority has a critical part to play in delivering the venues and infrastructure, not just for the Games but for generations to come," he added. Olympics minister Tessa Jowell said: "John Armitt has a huge amount of experience in engineering and construction, and is well-placed to lead an organisation charged with delivering one of the biggest and most complex building and regeneration projects this country has ever seen." The appointment means acting chairman Sir Roy McNulty has been overlooked for the full-time role, but he is to continue as deputy chairman of the Olympic Delivery Authority. In March it was announced building and regeneration costs of venues and infrastructure in east London, where the Games will be staged, now stand at £5.3bn. This includes £3.1bn for the Olympic Park and venues, up from £800m in the original bid document and £1.7bn for regeneration and infrastructure.